Game of Thrones Recap: The Ghost of Harrenhal - My recap and review of episode 5 of the current season of Game of Thrones. There were a lot of differences from the book in that episode. Game of Thrones Recap: The Old Gods and The New - My recap/review of last week's Game of Thrones which made me really want to punch Theon. Once Upon a Time: "An Apple Red as Blood" Review - It's almost time for the season finale of Once, and last week's episode is setting the stage! Read my review to learn more. 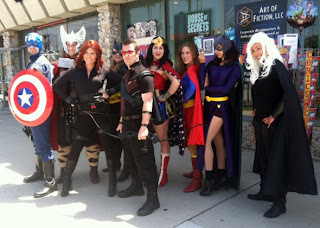 That's Our Joss - I sat down to write about The Avengers and mostly ended up talking about Joss Whedon. Because he's awesome. It explains why I'm proud to be a Whedonite and a little about why I think the Avengers is amazing. Free Comic Book Day Round-Up And Reviews [Feature] - All about my Free Comic Book Day adventures with mini reviews and my favorites of the issues I picked up. I love reading your Game of Thrones recaps. All the changes from the books are really stressing me out, especially with Dany's storyline--a lot of people are dying who were still alive at the end of the 2nd book!. A random tangent off of last night's episode brought me to the realization that there are a LOT more boys than girls born to the noble families of Westeros (I tallied them up). Surprisingly more. Is this something that has been discussed before? I ask because you seem quite knowledgeable about ASOIAF (I'm only on the 3rd book). I took a stab at explaining the gender imbalance on my blog, but I'd like to know if you have any thoughts on the matter. Free Comic Book Day is almost here!